Retro TV (formerly RTN and RTV) was one of the first digital specialty networks when it launched in July 2005. 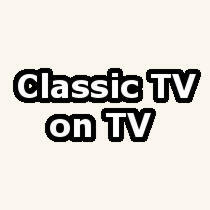 Over the past decade, however, it has been overshadowed in many ways by Me-TV, Antenna TV, and Cozi TV. As of June 2014, Retro TV was available in just 54% of households compared to 91% for Me-TV, 70% for Antenna TV, and 59% for Cozi TV. An affiliate agreement with Mako Communications that went into affect in December 2014 brought Retro TV’s coverage to 68% of households (which is on par with Cozi TV’s current 70% coverage). Recently, Retro TV announced it will be adding The Barbara Stanwyck Show (NBC, 1960-1961), Mister Peepers (NBC, 1952-1955) and The Jerry Lewis Show (NBC, 1967-1969) later this year as well as documentary series Crusade in Europe (ABC, 1949) and Crusade in the Pacific (syndicated, 1951). Check out the Retro TV news page for details. None of these are big name shows but neither are any of them true obscurities. I would say they’re all relatively forgotten to various degrees. Of the group, Mister Peepers is arguably the most well known. Reportedly, not all the episodes of the series have survived. S’More Entertainment released two DVD sets in 2005 and 2006. The Barbara Stanwyck Show was released on DVD in two volumes by E1 Entertainment and The Archive of American Television/The Television Academy Foundation in 2009 and 2010. Both Crusade in Europe and Crusade in the Pacific are also available on DVD. The Jerry Lewis Show has never been made available intact; there are two DVD sets with edited episodes. It remains to be seen whether Retro TV will air the full hour-long versions or the same chopped up half-hours that are available on DVD. In the past I’ve wondered whether audiences can support so many classic TV diginets (Decades will be joining the fray when it fully launches on May 25th). If competition for programming means shows like these are making it to the air, and potentially other lesser known shows, that can only be a good thing. I wish I had this network in my area. The programming is something different. I would very much like to see many of these series. I think MeTV is great, but they show so many series that have been shown so many times over the years. I recently started watching the 3 “oldies networks” available in my area. I really like this stuff! I just watched an episode of a show called “Police Surgeon” & found this site while searching for show info (the onscreen info guide didn’t list the year the show was produced & I was curious). As I watch classic tv, I’m well aware that I’m watching shows completely out of context. Something that seems quaint in 2016, might have been cutting edge for a viewer in 1967. It’s almost as if I have to watch with both sides of my brain. Okay. I admit I cracked up laughing when in an early episode of Dragnet, Friday & Gannon had to find a drug store and a nickel to make a phone call. TV purists, please forgive me. The thing about classic TV that has really grabbed my attention & my imagination, IS trying to put it into context. When I find the year a show was produced, I search for news headlines & social commentary from that year. It makes me wonder who I would have been – out in the real world – if that had been my time & place in history. Thanks for a very informative site!! !